Because not all girls want to wear shorty shorts or skinny fits—or pink, ruffles, or bows. Help us change the world of girls clothing! 668 backers pledged $30,253 to help bring this project to life. Girls Will Be has been featured on TODAY.com, CNN.com, The Huffington Post, Austin American-Statesman, St. Louis Post-Dispatch, Chicago Tribune, TIME Magazine for Kids, The Good Men Project, A Mighty Girl, and many other great blogs and publications. We started Girls Will Be for the girls in our lives. Because every season we struggle to find clothes our daughters want to wear. Grace (age 10) and Maya (age 8) want colors beyond pink or pastels, won’t wear sparkles or ruffles or bows, like things besides flowers and hearts, and need clothes that are comfortable, with plenty of room to run and jump and play. And they’re not the only ones! But finding clothes without any stereotypical “girly” touches is WAY too hard! Girls need more options to express their individuality! We want to create an entire line of “girl clothes without the girly” to help empower girls like our daughters to be themselves. No girl should ever feel like she needs to conform to the very narrow definition of what girls are “supposed to” be, and like, and wear, that is reflected in far too many clothes (and other products) out there today. We want more for our girls! We started by redefining girls t-shirts (see them here) and parents and girls loved them. Now we’re tackling another one of the biggest shopping challenges for young girls: SHORTS! Today’s options are pretty limited for girls who don’t like shorty shorts or a skinny fit. And if she also doesn’t want to wear pink or ruffles or bows (at least not ALL the time), good luck finding anything besides uniform-style khakis. Some girls might try boys shorts, but those are usually too big and baggy. Plus, girls really shouldn’t have to shop in the boys department! 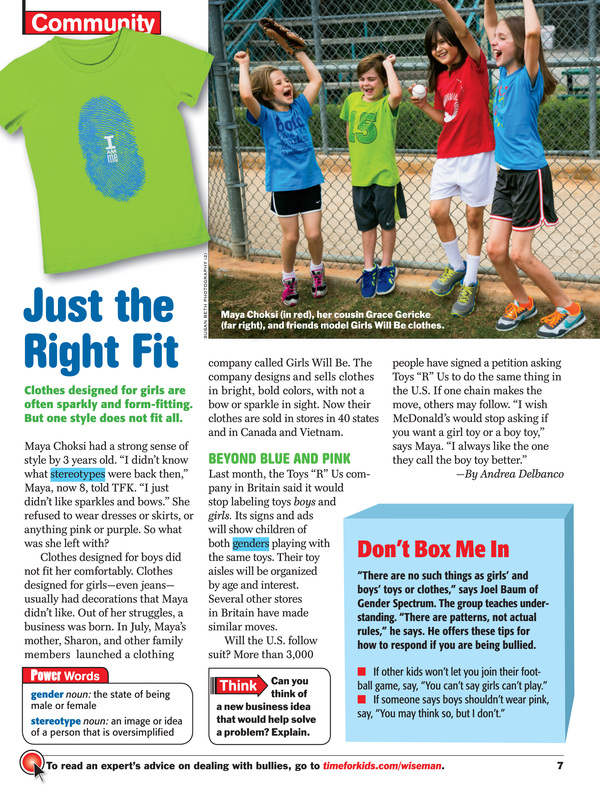 The Girls Will Be Casual Cargo Shorts (pictured above) and Perfect Play Shorts are both designed to let girls be kids! We need your help to bring these shorts to life! Your support will help cover the upfront costs of manufacturing our shorts, right here in the US. We have a lot of great rewards for you, even if you don’t have a girl in our size range (4-12)! As an exclusive offer for our Kickstarter backers, we are printing some of our most popular t-shirt designs in other sizes, from onesies to adults. Help us change the world of girls clothing! Thank you! Our Casual Cargo Shorts are made from a lightweight poplin fabric that is perfect for summer. They are ready for action with three sets of pockets big enough to actually hold stuff, hook-and-loop fasteners on the cargo flaps (no pesky buttons), easy hook and bar closure at the waist, adjustable waistband, and bar tacks for reinforcement in all the right places. These are the cargo shorts our daughters have always wanted! Our Perfect Play Shorts are made from a 100% cotton French Terry that’s super comfy, without being flimsy. We added contrast-color top-stitching, side vents, pockets, and a drawstring that actually works! We’re betting these become her go-to shorts for everyday summer fun! Colors - The sample shorts in our video and photos were made from sample fabric that had not yet been dyed into our custom colors. For our full production run, our shorts will be available in the following mix of neutrals and bright accents (sorry, but the light gray and white used for our sample shorts will not be an option). It’s no accident that these colors look pretty great with our t-shirts! Sizes - Our shorts will be available in sizes 4-12 (please note that the size chart below shows the actual garment measurements). We think you’ll especially love our generous inseams (5-8" depending on the size), which are MUCH longer than what you find on most girls shorts. If our project is successful, you will receive an email asking you to select your size at that time. It will be VERY important for you to return that survey within one week, so we know how many of each size to make. In return for your pledge, you can receive one of these rewards! We know it's a long list, but wanted to offer a variety of ways to combine our shorts and t-shirts, plus options for people without girls in our size range. To make your pledge, click "Back This Project" (at the top of the page) or click on the specific reward to the right. We are already working closely with the same US manufacturer that makes our t-shirts. We’ve invested over $8,000 in product development and the cost of pre-ordering our fabric and trim (buttons, elastic, etc.). If our project is successfully funded, we are ready to move straight into production and deliver the shorts in time for summer. The money raised on Kickstarter will go towards covering the manufacturing costs for our first production run (the minimum is 150 pairs of shorts per color, for a total of 900 pairs). But since Kickstarter is an all or nothing model, we don’t get any money if we don’t hit our fundraising goal. If our Kickstarter is wildly successful and we raise a lot more than our goal, Girls Will Be will use any extra funds to accelerate work on our next set of products. Nothing would make us happier! Our goal is to have an entire line of girl clothes without the girly, and we already have so many great ideas we want to bring to life. Girls need more options across their entire wardrobe (and beyond) - think pants, underwear, pajamas, “dressy” clothes, and even things like bedding. We want t-shirts and shorts to be just the beginning of our story! Thank you so much for considering our project. We would love if you helped spread the word by sharing this page via email, Facebook, and/or Twitter (you can use the social media buttons right below the video at the top of this page). And you can follow Girls Will Be on Facebook, Twitter, and at our homepage - www.girlswillbeHQ.com. With any project, there are risks. But our team has worked hard to mitigate them. As mentioned above, we have already ordered all the fabric and will be ordering all the trim in the first week of March. Our patterns are complete. We will be able to move straight into production once our Kickstarter is successfully funded, without risk of delay in sourcing all those materials. Plus we are working with the same manufacturer that makes our t-shirts and have already developed a detailed production schedule with them. They understand our deadlines, are committed to hitting them, and are just waiting on the green light from us to get started. Plus, they made the sample shorts you saw in the video and pictures, so we are confident in their ability to create a quality product. All of that said, with any project like this there is always the risk of something unexpected happening. We have left a buffer that should enable us to tackle most issues and still have a timely delivery in June. We believe strongly in transparency and communication, so our backers will be the first to know about any unplanned hurdles or delays. JOIN US! Be part of changing the world of girls clothing! We'll send a personal thank you and some awesome stickers. Plus you'll stay up-to-date on Girls Will Be through our backer updates. GOODIES! Give your girl a whole bunch of reminders that Girls Will Be...so many different things! Includes pencils, a plastic cup, bookmark, sticky notes, and tattoos! All printed with the Girls Will Be logo and some inspiring messages. POSTER (11x17"). Receive a print of any one of our Girls Will Be t-shirt designs on high quality, heavyweight, acid-free paper suitable for framing (frame not included). Super fun decorating idea for girls who don't fit into the neat little pink sparkly box of what some people think it means to be a girl. We get so many requests for our Girls Will Be t-shirt designs to be printed on onesies, toddler sizes, and adult t-shirts. Now’s your chance to get our popular “Be Bold” or “Be Unique” design for any age. We'll be printing them on super soft garments from Rabbit Skins (baby and toddler sizes) or Bella+Canvas/L.A.T (adult sizes, choose from unisex or women’s fit). PERFECT PLAY SHORTS (COBALT + LIME). Receive one pair of knit play shorts with plenty of room to move, a length that hits just above the knee, and a drawstring that actually works (be sure to pick the reward with the color you want). PERFECT PLAY SHORTS (NAVY + BLUE). PERFECT PLAY SHORTS (CHARCOAL MULTI). CASUAL CARGO SHORTS (OCEAN BLUE). Get one pair of the cargo shorts our daughters have always wanted! Plenty of room to move, a length that hits just above the knee, and three sets of pockets big enough to actually hold stuff (be sure to pick the reward with the color you want). Get one pair of the cargo shorts our daughters have always wanted! Plenty of room to move, a length that hits just above the knee, and three sets of pockets big enough to actually hold stuff (be sure to pick the reward with the color you want). CASUAL CARGO SHORTS (COOL GRAY). BUILD A PLAY OUTFIT (NAVY + BLUE). Start with one pair of Perfect Play Shorts (in Navy + Blue), then complete the outfit by choosing either one t-shirt from our Girls Will Be line (sizes 4-12) or one "All Ages Shirt" (described above). BUILD A PLAY OUTFIT (COBALT + LIME). Start with one pair of Perfect Play Shorts (in Cobalt + Lime), then complete the outfit by choosing either one t-shirt from our Girls Will Be line (sizes 4-12) or one "All Ages Shirt" (described above). BUILD A PLAY OUTFIT (CHARCOAL MULTI). Start with one pair of Perfect Play Shorts (in Charcoal Multi), then complete the outfit by choosing either one t-shirt from our Girls Will Be line (sizes 4-12) or one "All Ages Shirt" (described above). ONE OF EACH (Early Bird Special). Like both styles? Get one pair of Casual Cargo Shorts AND one pair of Perfect Play Shorts (you'll pick your colors later). Limited quantity available at this discounted price. ONE OF EACH (same as above, without the Early Bird pricing discount). Like both styles? Get one pair of Casual Cargo Shorts AND one pair of Perfect Play Shorts (you'll pick your colors later). BUILD A CARGO OUTFIT (NATURAL). Start with one pair of Casual Cargo Shorts (in Natural), then complete the outfit by choosing either one t-shirt from our Girls Will Be line (sizes 4-12) or one "All Ages Shirt" (described above). BUILD A CARGO OUTFIT (OCEAN BLUE). Start with one pair of Casual Cargo Shorts (in Ocean Blue), then complete the outfit by choosing either one t-shirt from our Girls Will Be line (sizes 4-12) or one "All Ages Shirt" (described above). BUILD A CARGO OUTFIT (COOL GRAY). Start with one pair of Casual Cargo Shorts (in Cool Gray), then complete the outfit by choosing either one t-shirt from our Girls Will Be line (sizes 4-12) or one "All Ages Shirt" (described above). 3 PACK OF PLAY. Love our Perfect Play Shorts but can’t choose just one color? Get all three! Mix and match sizes, if you want, for the different girls in your life. 3 PACK OF CARGOS. Love our Casual Cargo Shorts but can’t choose just one color? Get all three! Mix and match sizes, if you want, for the different girls in your life. WARDROBE PACK. Receive all six pairs of our shorts (three colors of Casual Cargo Shorts and three colors of Perfect Play Shorts), plus your choice of six Girls Will Be t-shirts to go with them, and one "All Ages Shirt" (described above) for you or your little bitty one (a $342 value). Mix and match sizes, if you want, for the different girls in your life. "DESIGNER OF THE MONTH." Your girl will work with our designers to create a new graphic that we print on our custom-made Girls Will Be t-shirts and sell on our website. You'll get 10 shirts to share with friends and we'll feature your young artist as our "Designer of the Month." We'll feature one girl a month between June and December, 2014. BE INSPIRED. Girls Will Be co-founder Sharon Choksi will come talk to your group of girls (whether it's a school group, brownie troop, sports team, or just a group of friends) about starting a business. We would love to help inspire the next generation of female entrepreneurs! Mainland US locations only.